Paintball fun with out the mess! Our shooting gallery uses real paintball guns but instead of paint filled balls, the paintballs we use are solid rubber so there’s no mess. 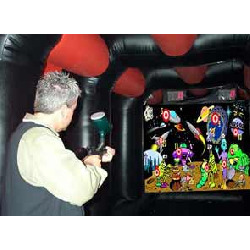 This self contained shooting gallery allows two players at a time to enter and blast away at the themed backdrop, features an electronic scoreboard. 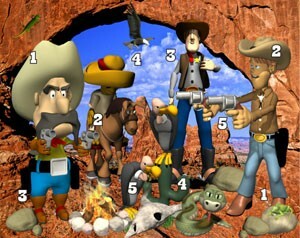 Choose from Wild West or Space Invader themes. Includes the gallery, theme, guns, paintless paintballs, face protection. Space invader theme. 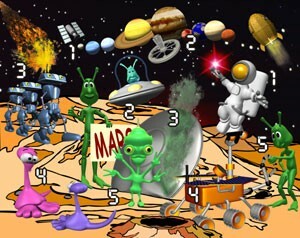 Blast the aliens and watch your score climb! 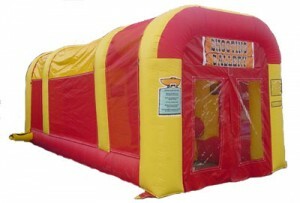 Truly the most unique and challenging inflatable shooting gallery available today! Two opponents attempt to hit the moving lit-up targets with paint ball guns shooting paintless paintballs.